Fall will be here before we know it and these Caramel Apple Pie Cookies will make for a comforting dessert. 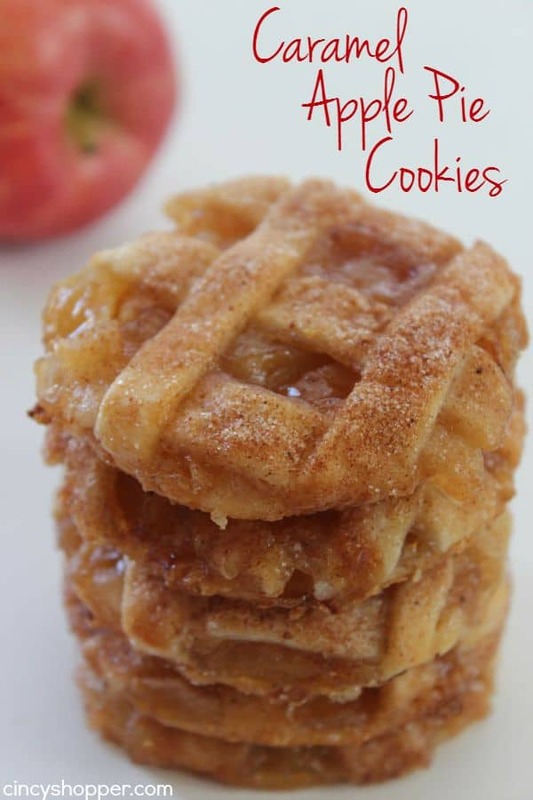 They resemble a mini apple pie and are super delish. Fun and easy too since they use simple store bought ingredients. Whip them up in just a few minutes time. I have always enjoyed fall. 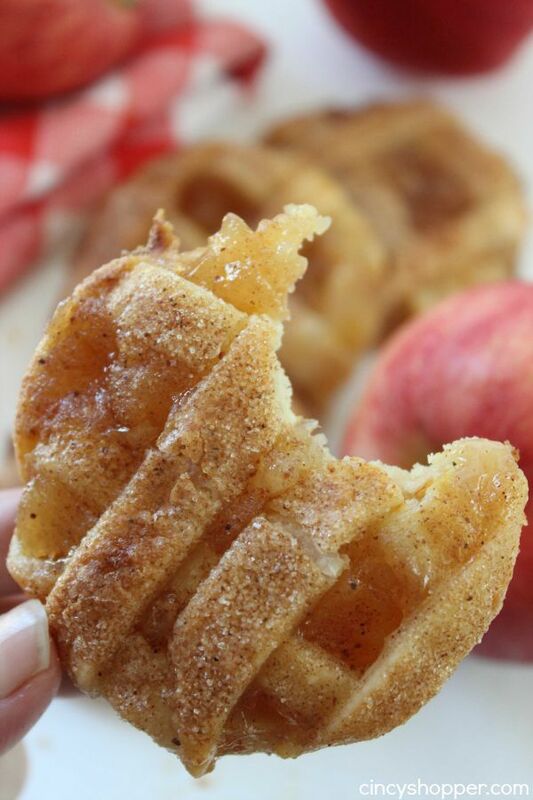 Fall foods are always so comforting. 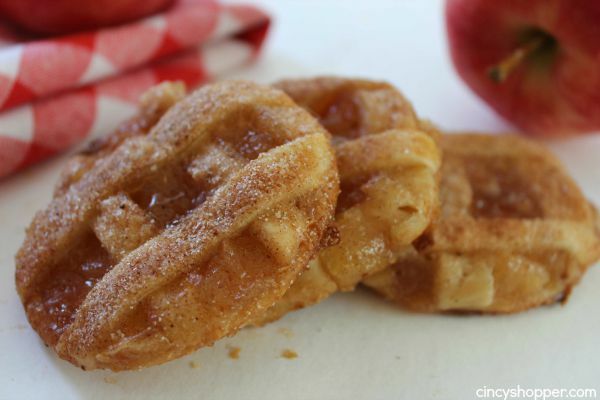 Apple desserts loaded with lots of cinnamon flavor and of course caramels are my favorites. 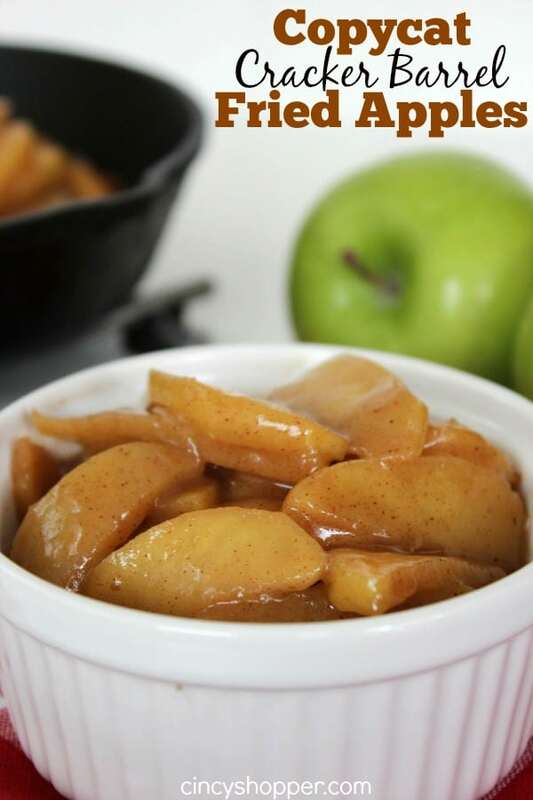 Last fall, I shared quite a few apple recipes with you like our Dutch Apple Pie and also my favorite CopyCat Starbucks Caramel Apple Spice Cider. I am really enjoying our summer but I am also looking forward to the cool evenings and comforting foods of fall. I know most of you are not thinking about fall at the moment. Being a food blogger, I like to share my favorite recipes with you before the season actually arrives. This way, you have plenty of great seasonal recipes in mind for when you are ready to start your baking. Having simple recipes that use store bought convenience items are some of my favorites. Having a recipe that I can whip up after school and have ready in a few minutes time can be nice. Recipes from scratch are always best if I have the time for leisurely baking. 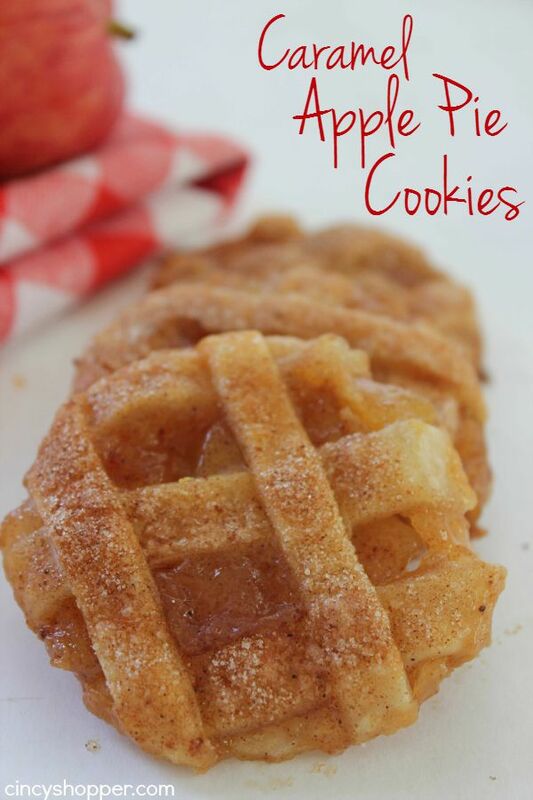 If you are a fan of caramel apple pie, these cookies will quickly become one of your favorites. I used a store bought crust, canned apple pie filling, and my new favorite Smuckers Salted Caramel Topping (this stuff is amazing), plus some cinnamon and sugar. YUMMY! These little hand pie/cookies were so tasty. The cinnamon flavors and caramel were very addicting. I cheated and even drizzled mine with some additional caramel. I think I may have a slight addiction to caramel, ha ha. Since this recipe only uses a few store bought ingredients, you will find it super simple. I was lazy and did not weave my strips of crust. You can always take the time to weave yours to make them look a bit more attractive. This recipe will be great with Homemade Apple Pie Filling. I am thinking they would be amazing with pumpkin pie filling for fall too! These little Caramel Apple Cookies will make for a great fall dessert. Great for serving a handheld apple pie to your family and guest. Plus they will pack well in fall lunches too! 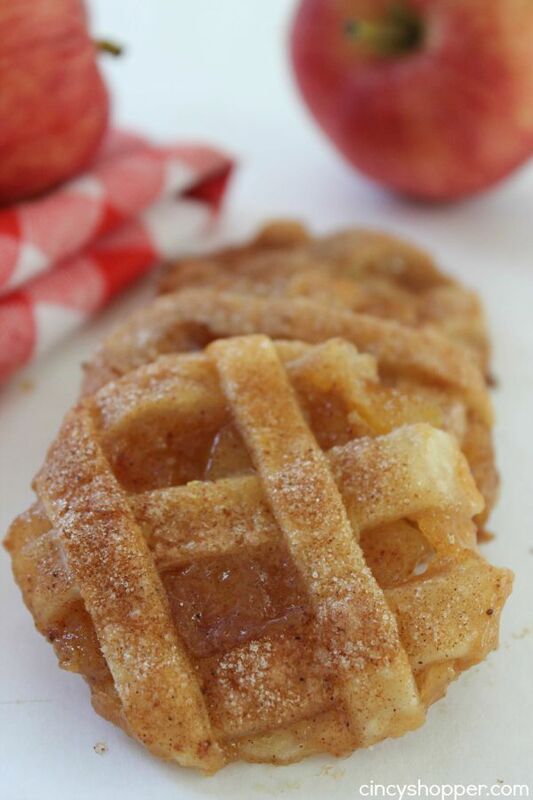 Do you have a favorite fall cookie? UPDATE: Many of you have been stating that this recipe is not working for you. When making these cookies they will seem as though they are really messy and not going to work. Once these are put in the oven and the caramel begins to cook in with the apples, you will have some oozing out. 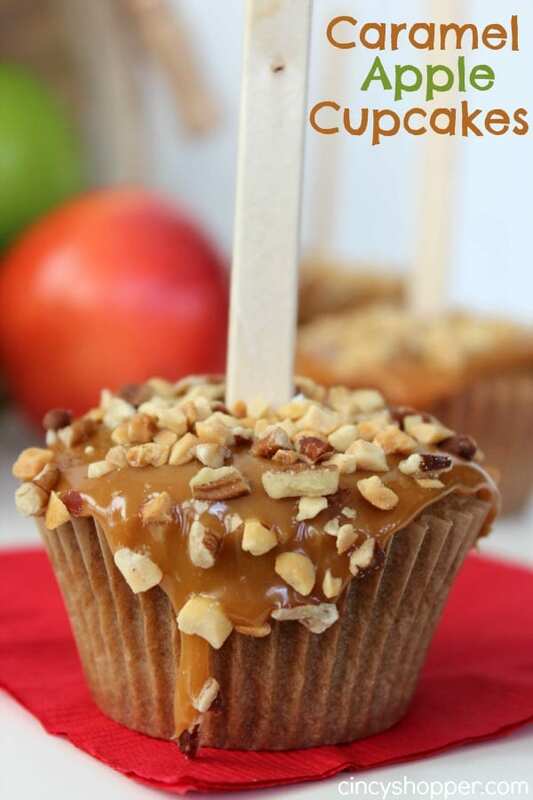 Trust me, they will come out just like my pictures with just a bit of trimming of the cooked caramel apple filling that oozes out. UPDATE: Another blogger has now pointed out that this recipe is very similar to one that she claims to have created that is now “owned by” Pillsbury. I saw this idea all over Pinterest and decide to make my own. So, this is MY recipe if you would like to call it that. It’s a pie crust with some store bought ingredients, not much of a recipe. But, you can see Pillsbury’s recipe here. This recipe has made my day!! I love apple pie and this is just AMAZING!!! Pinned! I would love for you to share this at my link party Making Memories Mondays going on now! There’s a great cash giveaway too! I love these cookies!!! Like a mini portable pie! These cookies look amazing! I can’t wait to try them this fall. Oh my! I’m glad to see I’m not the only one getting excited about the fall. It is without question my favorite season and lately I have really started wanting to do “fall” things! These look DELICIOUS. Thank you! Rachel, I live for the Fall/ Autumn season. Life would be perfect if I could live in Vermont the whole season. :-) I can’t wait to try this cookie & pie recipe! Yummy!! Found you from “This is how we roll” linky party. These look delicious! and soo creative!! Definitely would be a great dessert for Thanksgiving as well! OMG! I died and this is what heaven looks like! Have you ever heard of the word ‘perfection’? Because this is the perfect example! Wow, I still can’t believe how delicious this looks! I didn’t even know this was possible! This is now my number 1 favourite cookie, no doubt about that! I’m so adding this to my July Favourites next week! Those look amazing! 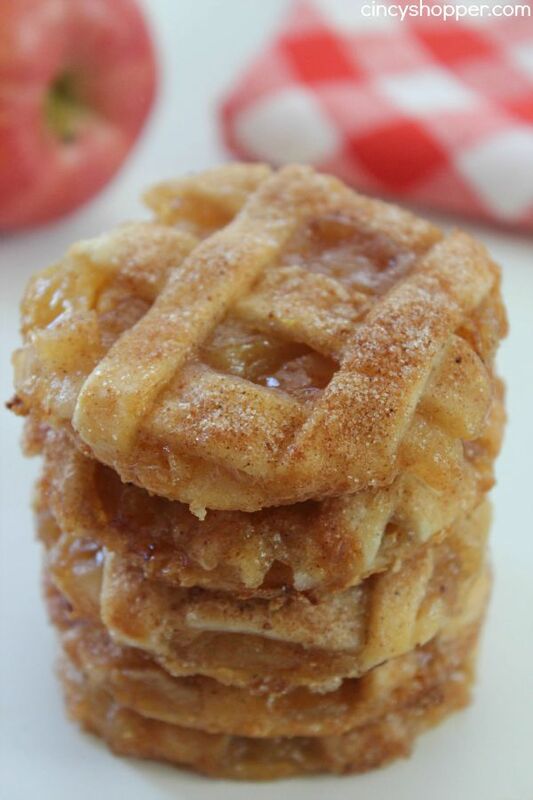 Can’t wait to make these with my apple-pie-loving daughter. I love your apple pie cookies and I really wanted to feature them this week at Dream. Create. Inspire. Link! But unfortunately you didn’t include a link back. We would love to see what you make this week! Thank you for sharing! Such a fun dessert for summer picnics! Thanks for linking up with What’s Cookin’ Wednesday! Yea they look great but how about a qty and how to store since I have a large family and need to make a bunch…. I have tried these and everyone that loves pie, love these. I use a 21 oz can of apple filling (Had about 1/2 cup left). With the two pie crusts I can get about 17 (mason jar lid size). Also, I cut the “cookie size” out first, then layer with caramel, apple filling, and crust strips. Eggs wash. Drizzle with your sugar, nutmeg, and cinnamon. The temp on my stove , set at 350 degrees makes them just fine at about 25-30 minutes. I made mine for a style show, babyshower, and just because. Going to try cherry and peach next! Thanks was wondering what to cut out the cookies with….Im not the susie homemaker in the kitchen so this helped with your comment about doing the cut outs first! YUM – these look amazing!! What a fun twist on a regular cookie. Love it! Congrats your post was picked as one of our highlighted posts on the #HomeMattersParty linky. You can see it at http://adventuresfrugalmom.com/home-matters-linky-party-49/. What do you do with extra dough cut away. After you cut out the circles. How do you capture and use excess? That was what I was wondering as well. Putting the toppings on first, you can’t re-roll. I would think there would be some odd shaped cookies here and there, because there’s no way I’d throw that away! Also was wondering about how many this makes. Cut into squares rather than circles to eliminate any odd shaped remnants & to use ALL the dough. I had no problems balling-up remaining dough to cut-out three more cookies. About 17 in all. These can be enjoyed anytime of year. You don’t have to wait until fall to have one. WOULD THESE KEEP LONG ENOUGH TO SHIP TO SERVICEMEN OVERSEAS?R PROBABLY A MONTH. If you use a triangular cookie cutter, they resemble a piece of pie AND best of all, you’ll get more cookies and very little scraps left over…. These caught our attention here at U.S. Apple Association! YUM! I see a repost coming along on our social media. Thanks for the amazing apple inspiration! when you cut the circles is there little pieces of the dough left? and what do you do with these? up and cut out more cookies. I’m allergic to eggs so I can’t eat a lot of cookies. I believe I could do away with the egg in this recipe, probs sub brushing with milk instead. If you cut them square then there would be no waste. My daughter and I made this recipe over the weekend and I took them to a party! What a hit they were. I love it. Very easy but messy. I think the next time I do this, I will put it on a pizza pan and bake it all and then cut them into bars, Thank you! I was thinking of the same thing. Did you try baking it like a pizza and if so, how long did you bake it? 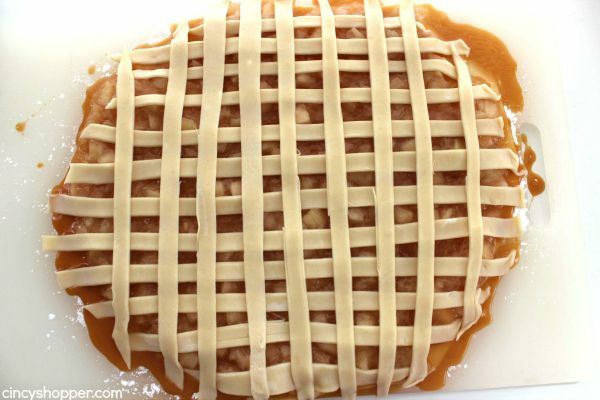 Another person write that they cut out the circles first and then put o the caramel and apples; less waste. I was thinking the same thing. Why not bake then cut to reduce messiness and waste. Would these keep in Tupperware? Or my guess is that the need to be refrigerated? I didn’t want to throw away the scraps either so i lined a jelly roll pan with parchment paper and laid the scraps on top of it the best i could (in one layer) and just sort of tried to squish everything together. I baked it til it was brown, let it cool a bit, cut it into squares and removed it from the parchment. It was great…..and NO waste!! They certainly aren’t as pretty as the original cookies, but my family didn’t care! How are you cutting these into circles? Cookie cutter, Mason Jar lid and paring knife, 3 oz plastic cup turned upside down. All depend what size and how many you want to make. Larger size…fewer cookies. I got about 17 using pint lid. I made this Carmel Apple Pie Cookie recipe and to it to a committee meeting tonight and everyone liked them. I even liked them, so they had to be good! Messy to make, but something different for a change. I got 17 whole circles and a few scraps. I used 2 Betty Crocker boxed pie dough mixes. Just made it taste more homemade. Had to bake them longer than the recipe called for. 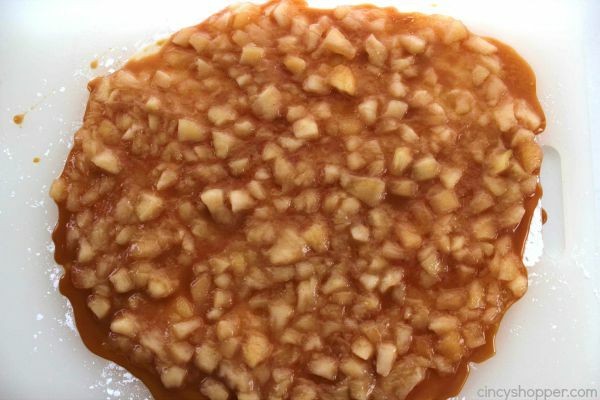 Caramel Apple Pie cookies – they are “the bomb!” WOW Having been raised by depressions era parents and a most wonderful baker, “waste not, want not”, I rolled out my bottom dough in a rectangle and cut the cookies in squares. Baked them on silpat sheets – – – immediately after removing from oven, I took my flat spatula and smooshed the spreading caramel against each cookie – – – only takes a second and who wants to waste caramel, ha ha ha. Great posting and thanks so much for sharing. Hello- have you ever tried freezing these? made these today and had issues with cookie trying to fall apart when transferring it to baking sheet. Don’t know if I will make again. If I do, I think I might put the whole thing together on a pizza pan then bake and cut after they are done!!! I just made these today. I found them quite time consuming to put together in spite of the shortcuts with pre-made products. I liked the idea of the person who put the caramel and apple on each cookie. I may try that next time. I know now that I probably used too much caramel and apples because they melted all over the cookie sheet and made a mess. I tend to think it will be better with more and that’s not always the case. Live and learn. I did learn a few things and they were good enough that I will try them once more at least. As far as time consumption, they turn out great I think. 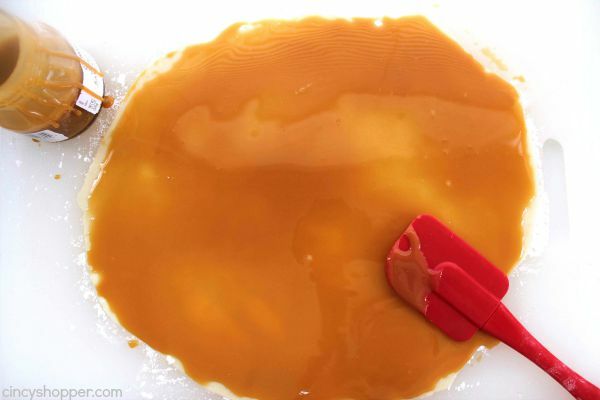 With the caramel, just use a 1/2 teaspoon, then spread on cookie with back of spoon. 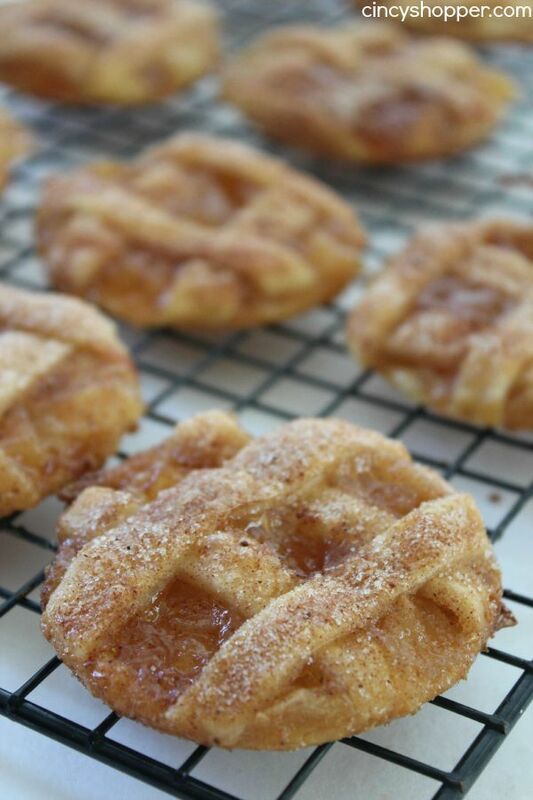 Pre-cut your lattice pieces and place 4 (make a square, overlapping corners), sprinkle with sugar,nutmeg, cinnamon mix. As it bakes it will not spread, so you can bake them very close together. I do 34 at one baking time (26 minutes at 350). I leave them to cool on pan covered with parchment paper for 3-4 minutes. Transfer to cooling rack. Due to the extremely sticky and messy nature of these cookies, use parchment paper on your cookie sheet. I did and I’m so glad. The cookies are very tasty but what a sticky mess they are to make, cut, transfer and get off the baking sheet. And so much of the dough/filling goes to waste. I got 17 total cookies out of it. Not totally worth the effort and mess. To omit the waste I cut my cookies in squares and they were very good… I will make these often. Thank you for the recipe and pictures. 1. These taste AMAZING!!! could NOT be happier with how they turned out!! 2. I did get a little nervous when the filling spilled out while in the oven but it’s just like you said, with a tiny bit of trimming, they turn out looking FABULOUS! THANK YOU! for this recipe! It was awesome! If you don’t want to waste the trimmings, spray a small cake pan with cooking spray and just throw all the trimmings in there, top it the same as the cookies n bake the same. Voila….apple pie casserole, throw some ice cream on top and yum!!! No wasting!!!! OMG! I have to try these. They look amazing and I love apple pie. Never thought about making a cookie out of it. Cannot wait to try this. I know my kids will love this. I was a doubter that these would work, but they did! I used the apple pie filling with caramel in it. AND… I used the left over yumminess by putting it all in a loaf pan lined with parchment, drizzling caramel over it, and baking it into an apple pie crumble, perhaps? Then sice and serve with ice cream or whipped cream. Devine and NO WASTE!!! :D Ta-da! 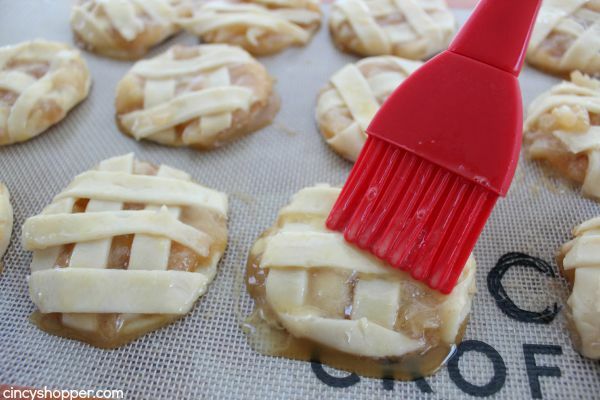 If you are worried about wasting with caramel apple pie cookies, roll out the piecrust in a square shape and make square or diamond cookies. They all taste the same!! Just different shapes and no waste. If anyone is worried about the wasted pieces, instead of using a cookie cutter use a pizza cutter and make squares instead! No waste and it’ll still taste just as yummy. I made these and they didn’t come out at all. I am bummed. I don’t know what I did wrong. They wouldn’t stay together at all. These cookies look amazing and I can’t wait to bake them! 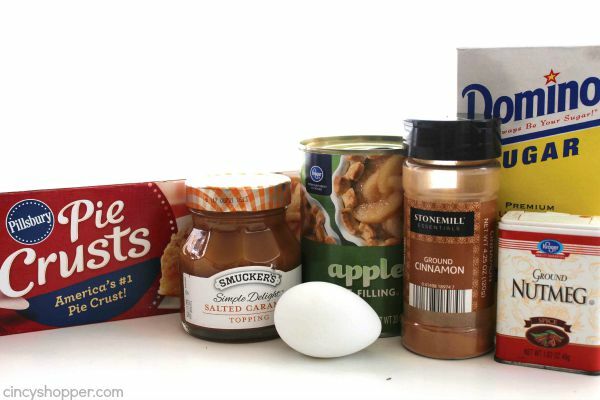 I’m wondering if anyone tried baking them with any other pie fillings as suggested, specifically pumpkin pie filling? With Thanksgiving being tomorrow, I’m considering giving that a try. . . I am still confused. Should I leave it in starters or should I propose this at the end of the food???!! Love! Super easy to make, delicious and so cute. I put all the scraps in a glass dish, brushed with the egg mix & sprinkled with the sugar mix just like instructed for the cookies & served it with vanilla ice cream. Make squares, cover square with caramel, put pie filling on one side, fold over into a triangle, seal with a fork and you now have an apple (or any flavor you want) pop over. 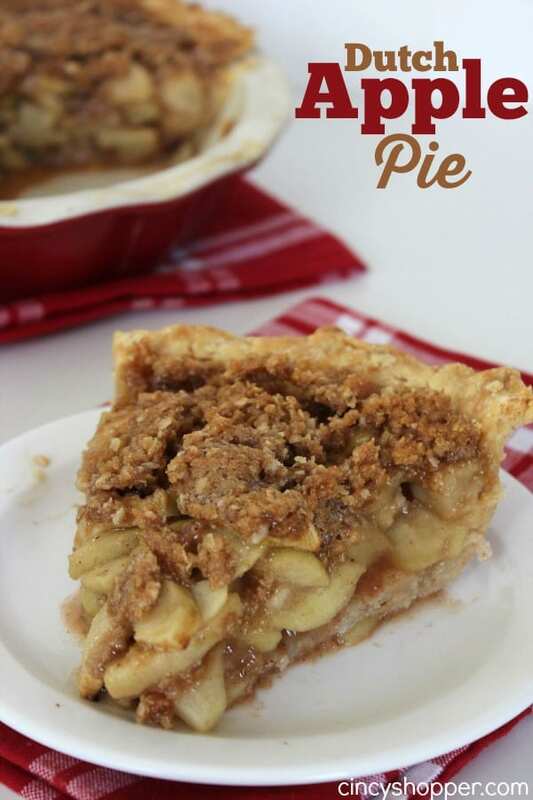 No wasted pie crust, filling or caramel. You can even drizzle with powdered sugar glaze and extra caramel. What a great idea! Very creative and easy to make. Will definitely make them this Autumn. I make apple gallettes all the time and this would be great for that too with the salted caramel…YUM!!! Thanks for sharing this recipe. 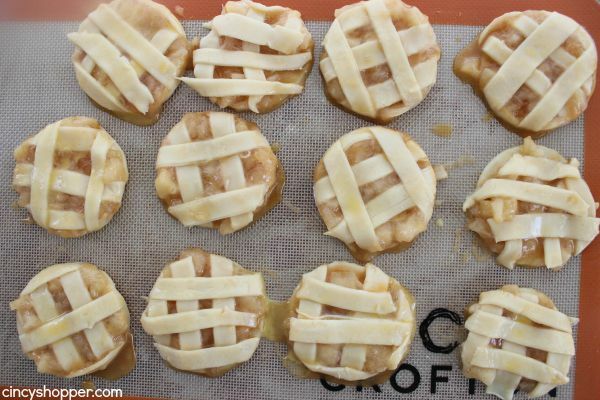 I am definitely sharing these are pie cookies in my apple roundup. They are so cute and easy to make. These look amazing! Thanks for sharing with the Delicious Dishes Recipe party this week! There are lots of recipes being tried with pie crusts and crescent dough. Busy people love short cuts. And most recipes I see are personal preferences or variations of other recipes, so I think it is very unfair for someone to say it is not your recipe. As far as being worried about waste, people can use the leftovers however they want, My grandmother always cooked the extra bits for us kids, who really hated waiting until after dinner for a sweet taste. It is not much waste to begin with. As for making it square shaped or pie shaped, or whatever, you took the time to make them look very appetizing. The look of these cookies sure caught my eye more than a square slab or a flat pie would have. Keep on doing what you enjoy, because it does bring joy, and I must admit, a bit of drool, to most of us. Is there a way this,could be a dump cake or crumb cake? Would it need adjustments for that? Or is there such a thing as gluten-free refrigerated pie crust now? My whole family has Celiac Disease. I have yet to find gluten-free refrigerated pie or pastry dough. Your photography skills are great. I found you on Merry Mondays. Love the pie twist on cookies. Looks yum. Thank you for sharing with us at #HomeMattersParty. We would love to see you again next week. Is there a way I can make it without the pie crust? Do you have a recipe for pie crust I could use that would work? I really am exited to try these, I hope I can get some other dough to work if you don’t have something in mind, thanks so much for posting this, it looks delicious! Hi, can these be made without using caramel? These look and sound amazing! Boo on that other blogger! What a meanie! Sharing! Thank you for sharing on Merry Monday! Hope to see ya next week! OH MY HECK! I would eat every single one of these cookies. They look so delicious! I have a suggestion that might make them a little less messy. Don’t cut them until the whole thing is baked and partially frozen. The will leave nice crisp lines when cut with no oozing of caramel. I work for a hotel in a commercial pastry shop. This is a process we use for most desserts for the nicest looking end product. 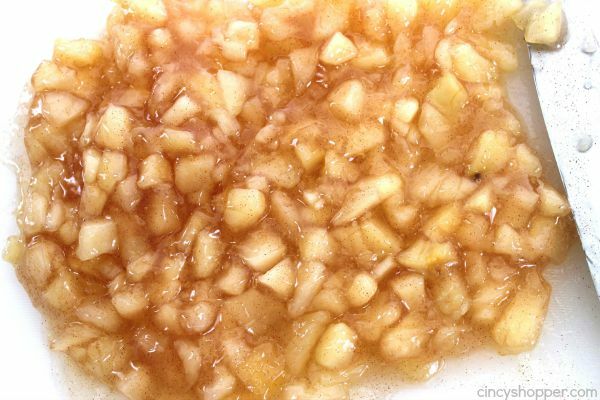 I did not read all the comments, but I will definitely try this recipe, I love apple pie…. 5 – has some chewy-gooey parts! The reason for my comment is this my Mother-in-law used to make an apple roll just to avoid making pie crust. I never got her recipe, wished I had. I digress, you spoke that people don’t like the recipe because of the waste. So don’t waste it grease an small pan. Square, round or oblong place it in the pan! Tada! Instant “Carmel Apple Pie Roll!”👍👍💖🤗 All 5 of my requirements for edible Apple Pie!! Enjoy no more wasted food! Thanks Jen keep inventing recipes! I’m not good at cooking much, but I like apple pie. So I’ll probably try this recipe. Can’t wait to see how it is. Thanks for sharing.